Just Going to the Dentist by Mercer Mayer was published in print in 1990. The book takes young readers through all the steps of a typical dentist visit in true Little Critter style, reassuring little ones about a sometimes scary and unpleasant experience. The digital version adds a new twist, keeping track as the reader tries to find all the little frogs and spiders (20 of each) hidden on almost every page. For young readers and pre-readers, the text also highlights as the narrator says each word. The delightful child narrator is easy to understand and a perfect fit, since the story is told in the first-person by Little Critter. Overall this is a cute book and perfect for preparing children for an important routine in a fun way. Little Critter is off to the dentist's office. He gets a thorough checkup and cleaning, complete with dental x-rays. When Dr. Ghum finds a cavity, Little Critter bravely gets a filling. 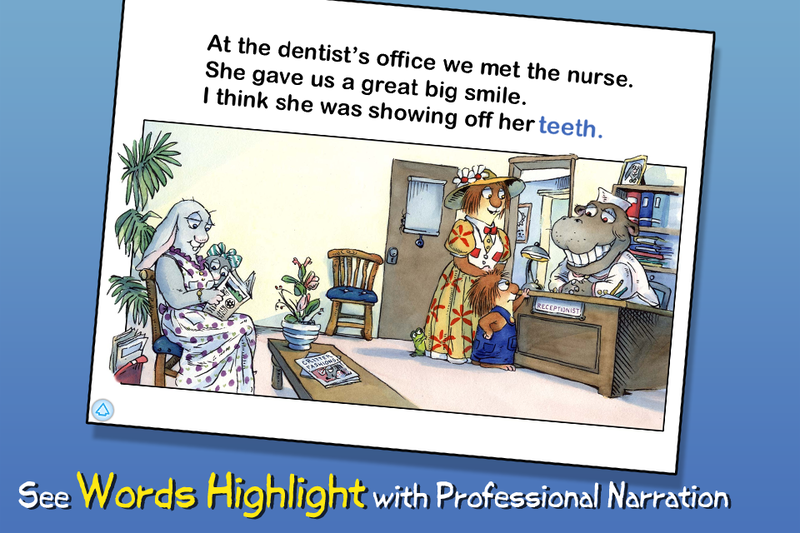 The visit is painless and Little Critter's good nature reassures young readers that going to the dentist is not that bad after all! Mercer Mayer's Little Critter stories, which address all the major issues of growing up, are perennial favorites of parents and children.